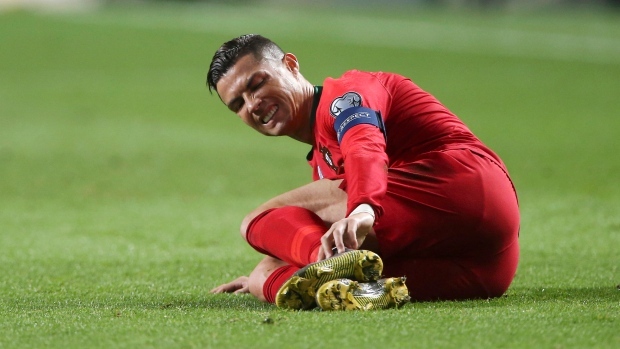 Cristiano Ronaldo was subbed off early during Portugal's Euro 2020 qualifier against Serbia on Monday with an apparent injury. The 33-year-old Juventus forward pulled up mid-sprint and clutched his right leg before indicating to the bench that he needed to come off in the 30th minute. Benfica midfielder Pizzi came on in his stead. Portugal was trailing 1-0 at the time on a penalty from Ajax's Dusan Tadic. Porto's Danilo Pereira since equalized before the conclusion of the first half. Juventus, currently atop the Serie A by 15 points on Napoli, are next in league action on Saturday against Empoli. Ronaldo and Juve are set to take on Tadic and Ajax in the first leg of their Champions League quarterfinal on April 10.